With his long term writing partner and friend Yvette Huddleston, Walt wrote two books on the subject of one of his great passions: the Yorkshire Dales. “A Day in a Dale” was published in 2011 and is largely based on a series of articles which Walt and Yvette wrote for the Yorkshire Post. “The Barefoot Shepherdess” was published in 2012 and is a collection of writing on significant women living and working in the Yorkshire Dales. They both feature Walt's photographs. 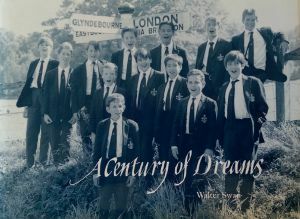 In 2001 Walt also wrote “A Century of Dreams”, a celebration of Trinity Boys Choir’s landmark achievement in Benjamin Britten’s “A Midsummer Night’s Dream”. Walt began teaching at Trinity School in 1977 and became the school’s first Head of Drama. A Moderation of Honour is a wryly observed look at academic life and the comic mishaps of Oxford university student Andrew Josephs. It is loosely based on some of Walter’s own early experiences as a student at Hertford College, Oxford coming from a background that was quite different from many of his contemporaries. Here we discover Andrew in a classic morning-after-the-night-before scenario. explores the mystery surrounding a young wife who goes missing. An extract from chapter three is here. Some of Walt's poems are featured in the Wharfedale Poets anthology, Drystone Lines. Please see the Poetry section for more details.